Unidentified Mezcala artist. Head. 3rd c. BCE–1st c. CE. This one-gallery exhibition juxtaposes a work produced at the end of Moore’s career with a selection of ancient American artworks like those that he encountered at the British Museum and influenced his career as a sculptor. The centerpiece is The Three Rings (1966), a sculpture created from Red Soraya marble that has been lauded for its organic, fundamental forms and its ability to transform depending on a viewer’s perspective. The sculpture is surrounded by 15 small stone sculptures produced by Mezcala, Atlantic Watershed, and Gretater Nicyoa artists—juxtaposing ancient and modern and European and ancient American. 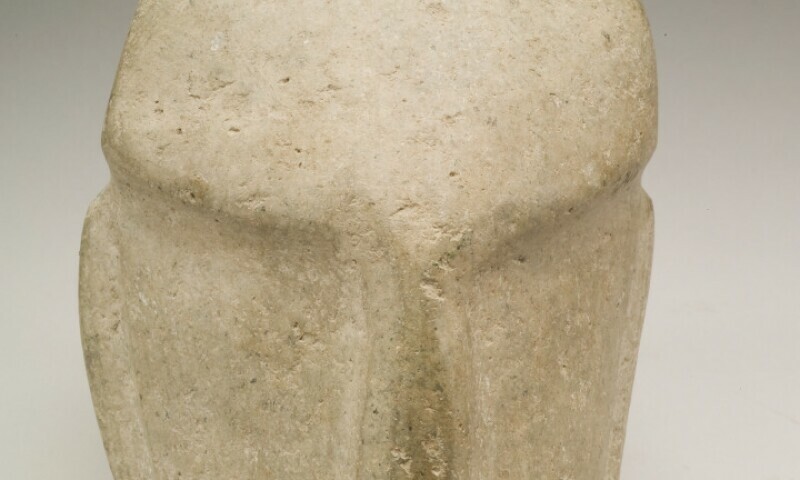 While other modernists, such as Constantin Brancusi and Alberto Giacometti, drew inspiration from ancient American art, Moore stands out for the depth, breadth, and intensity of his engagement as he continued to study those works, read scholarship, and visit Mexico throughout his life.